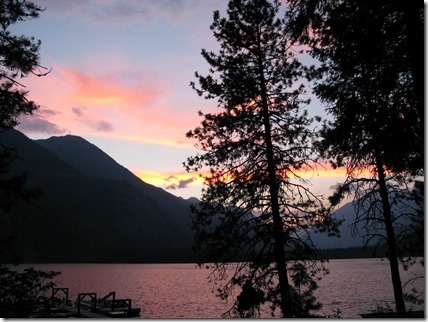 We got up at 7:00 a.m. to take the Lady Express 51 miles "up lake" to the remote area of Stehekin -- an area only accessible by boat or float plane. It's a 2-1/2 hour ride via the Express, which we immediately dubbed a "3-hour tour" (see Gilligan's Island). 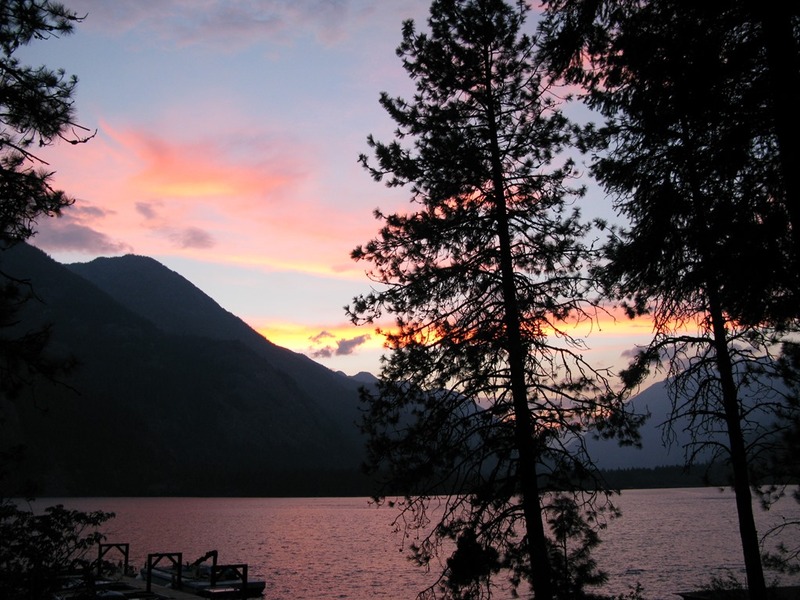 Lake Chelan is the deepest lake gorge in North America. 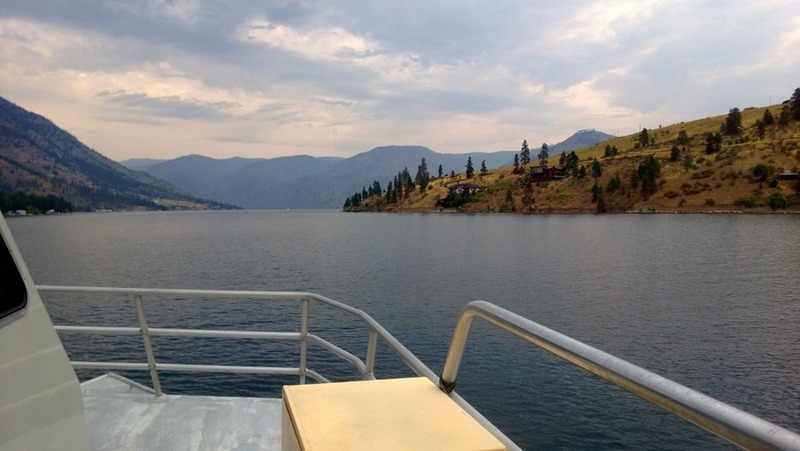 Lake Chelan has two basins, the smaller Wapato Basin (400 feet deep and 12 miles long). The Lucerne Basin is 1,486 feet at its deepest point (and 386 feet below sea level). The Lucerne Basin holds 92% of the lake's water. 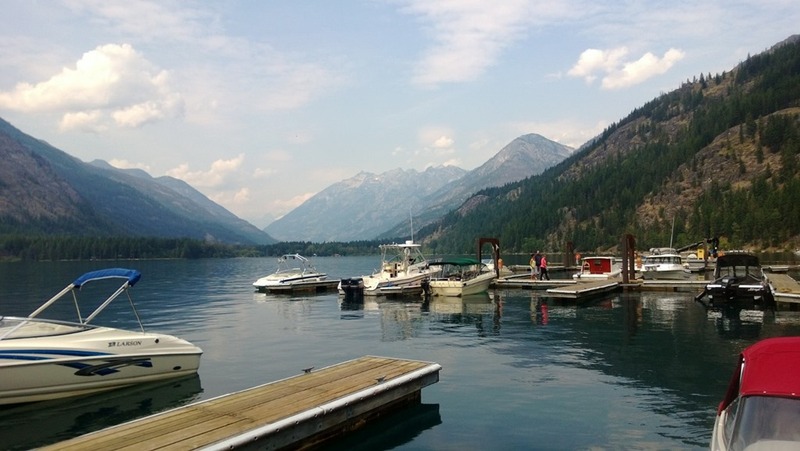 Stehekin resides within North Cascades National Park. 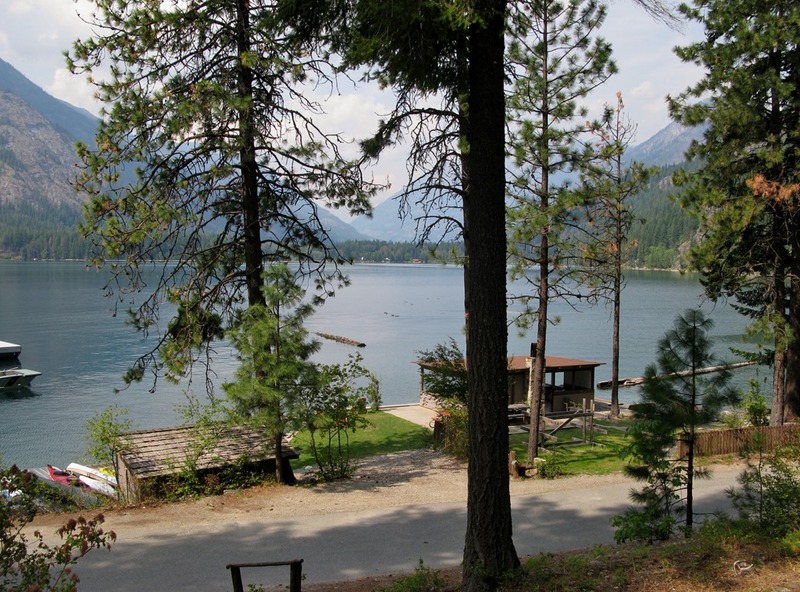 After a brief layover at Field Stop Landing (16 miles up lake) to pick up more passengers and cargo, we arrived at Stehekin Landing around 11:00 a.m. The Landing was also the location of North Cascades Lodge, our home base for two nights. But check-in wasn't until 2:00. We stowed our bags in the Lodge General Store behind the ice cream freezer, and hiked to the Golden West Visitor Center. 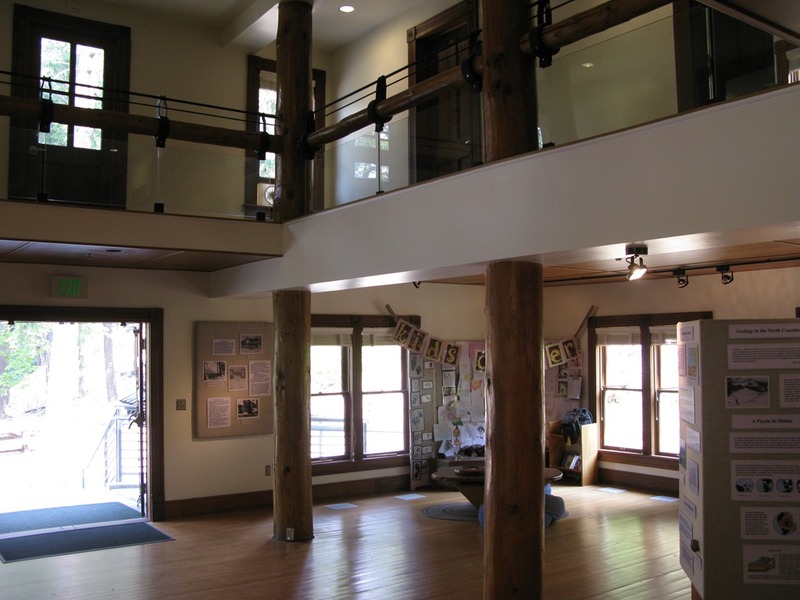 While we were looking around, the ranger there told me that much of the materials for Golden West, including window frames, stairs, and doors -- even some glass panes --came from the Victorian-era Field Hotel. From what I read, starting around 1905 the Field Hotel had been one of the finest places to stay in the Northwest, catering to both miners and tourists. But the Lake Chelan Hydro Project, started in late 1920s, would raise the lake surface 21 feet, submerging the hotel's location. Not wanting to let the good materials go to waste, they recycled as much of Field Hotel as possible. 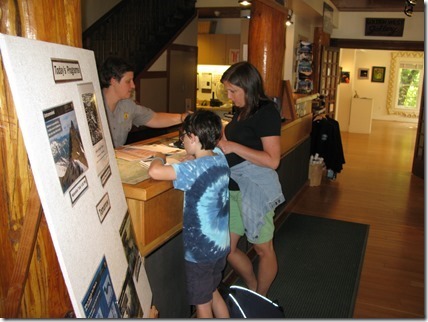 After that, we went to lunch at the North Cascades Lodge, and finally got into our room around 1:30. 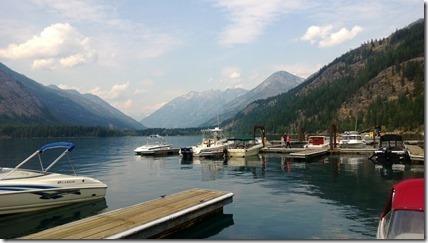 As we circulated through Stehekin, I started to notice how different it was from the town of Lake Chelan. There were a lot of serious backpackers here, as Stehekin is a trailhead for many North Cascades trails. People living and working here (only 95 year-round residents) possess a brand of hospitality and community that goes way above most small towns. A few examples: Everyone waves from their car. People ask where you're from and seem genuinely interested. The owner of the bike rental shop offered a free bike for Drew to practice on during the evening. The tourists also seemed to be of a different caliber than the jet ski types at the other end of the lake. In addition to the hikers, many people seemed to be visiting from all over the world (for example, our neighbors next door at the lodge were European). For dinner that night, Brenda cooked up a very western hot dogs and beans. We decided to eat on our deck to enjoy the tremendous view. As we started eating, a few bees buzzed us (as had happened all day long). But within minutes, there were squadrons of bees dive bombing our food. The first person to fold was Cameron, and then Drew. But when I had five or six bees swarming me (and my food), I threw in the towel, too. I like to enjoy my dinner, and this wasn't enjoyable. Finally, Brenda gave up. Dinner tasted great once I stopped swatting bees. Later on, I went outside to view the sunset, an explosion of pinks, whites, and blues in the sky that seem to be amplified by the surrounding mountains and lake. As night replaced twilight, I stepped outside to view the stars (which I thought would be extra bright due to the lack of light pollution). But I kept catching a strange fluttering out of the corner of my eye. After this happened a few times, I realized these were bats! I retreated indoors to a bedroom window, where I watched the bats swooping past lights. Then I saw some people walking up the path from the road, a mother and young son. They stopped dead -- pointing at the bats circling around their lodge door. I watched as they finally gathered enough courage to walk into the swarm. Like a scene out of The Birds, the mother stood there in horror, as the bats streaked around her, hurrying her son to unlock the door. I guess she was as creeped out as I was. They got in and slammed the door. I slept well that night, thinking of bats flying around outside. I hoped they got a few extra bees so we could eat dinner on the deck the next day.